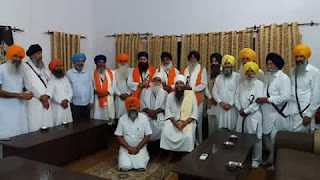 BATHINDA, Punjab—During a meeting held today at Talwandi Sabo, three Jathedars appointed by Sarbat Khalsa 2015 said although they are willing to work with the suspended Akal Takht Sahib Punj Piare, the entire gathering will only take place under their own supervision. In a press statement issued after the meeting, it was said that the letter issued by Jathedar Bhai Jagtar Singh Hawara was not inline with Sikh values and principles. “Jathedar Jagtar Singh Hawara asked that November 10, 2016 Sarbat Khalsa shall be held under supervision of Punj Singhs, namely Major Singh, Satnam Singh Khanda, Satnam Singh Khalsa, Mangal Singh and Tarlok Singh. This is not in accordance to Sikh values as Punj Pyare title was only given to Bhai Daya Singh, Bhai Dharam Singh, Bhai Mohkam Singh, Bhai Sahib Singh and Bhai Himmat Singh by Guru Gobind Singh Ji. Five Singhs who do seva at Amrit Sanchars or other religious events are only Punj Pyare for that time being. They cannot be consider Punj Pyare afterwards,” the statement reads. The meeting today was attended by leaders of the Shiromani Akali Dal (Amritsar), United Akali Dal, Shiromani Akali Dal 1920, Panthik Seva Lehar. These leaders include S. Simranjit Singh Mann, Bhai Mohkam Singh, Bhai Gurdeep Singh Bathinda, Buta Singh Ransih, Paramjit Singh Saholi, Baba Pardeep Singh Chandpura, Prof. Mohinderpal Singh, Jaskaran Singh Kahan Singhwala and several others. Earlier, in a press note issued by S. Simranjit Singh Mann on the website of Shiromani Akali Dal (Amritsar), doubts were raised over the authenticity of the letter by Jathedar Bhai Jagtar Singh Hawara. The press note by S. Mann states that either someone misused Bhai Jagtar Singh Hawara’s name or misguided him. “Bhai Jagtar Singh Hawara is incarcerated several kilometers away and he may not be acquainted with the ground reality of Punjab. We will only abide by hukamnamas issued collecitvely by the three Jathedars,” the press note states.